PQX Cement is a quick setting, ultra rapid strength gain cement for use in producing concrete for the rapid repair and replacement or construction of infrastructure where time is limited due to the client’s possession allowance. PQX Cement is a factory blended product comprising of Portland cement and a group of special high performance binders/modifiers which control hardening rates, volume stability and in service function ensuring consistent quality performance. 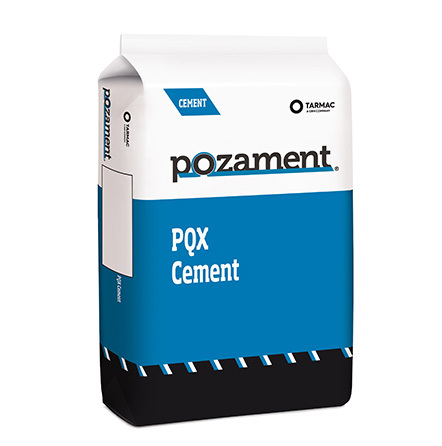 PQX Cement should be used as a direct replacement for Portland cement in the production of concrete. Concrete manufactured using PQX Cement is ideal for situations when restricted working time necessitates ultra rapid strength gain allowing infrastructure to return to service in a limited timeframe. Typical applications include the replacement and repair of airfield and highway concrete pavements, concreting car park decks and replacement of industrial floor slabs. PQX Cement is also used for constructing marine structures where tidal influences effect construction time. We recommend the delivery of PQX Cement produced concrete via BSI accredited volumetric operators that have received training from Pozament in the installation of our high performance product. This installation method offers a truly flexible solution to time prohibitive or dangerous situations, vastly reduces waste material and the economic impact of overrunning works. For details of our recommended contractors, please contact the Pozament technical sales department.